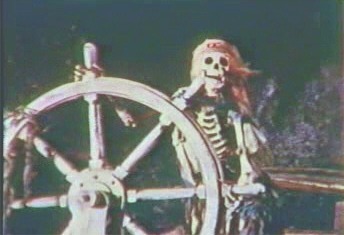 The Pirates of the Caribbean ride at Disneyland is 50 years old, but there are probably still things that you don't know about it. Disney Imagineering Legends Marty Sklar, Orlando Ferrante, Tony Baxter, Kim Irvine, Luc Maynard and Nancy Seruto gathered at the D23 Expo's "Pirates of the Caribbean: 50 Years of Swashbuckling Adventures in Disney Parks" panel Friday to chat about their favorite parts of the ride and to reminisce about the days when it was new. When the city of Anaheim's fire department first came to check out Pirates, they were worried, Sklar remembered. The fire scene toward the end of the ride was so convincing, they worried they wouldn't be able to tell a potential real fire from the fake one. So, though it's only rumored, Baxter and Sklar believe there's a switch somewhere in the ride that turns off the fake fire in the event of a real one. Baxter worked at the park as an ice cream scooper when he was a teenager and often snuck away to get a peek of Pirates as it was being built. One day, Imagineer Claude Coats caught Baxter peeping and invited him in to tour the nearly-finished ride. "I spent an hour with Claud, ran back to scoop ice cream and they docked me an hour of pay," Baxter recounted. "I said "that's probably the best one hour I ever spent. You can keep your $2.'" Bonus: Baxter snuck in again to ride in a boat as Pirates was being tested on the day Walt Disney died. Kim Irvine's mother was among the Disney employees who built the original scale model for Pirates. And she might have pilfered a few of her daughter's belongings to get just the right look. Irvine said she remembered being suddenly unable to find little items around the house such as bobby pins, and asked her mother where they were. Turns out bobby pins make great jail cell bars for tiny model criminals. When Xavier Atencio, then a first-time script writer, rode Pirates with Walt Disney, he worried he'd written too much dialogue. But, according to Sklar, Disney thought it was perfect. "Think of it as a cocktail party," Disney reportedly told Atencio. "You hear pieces over here and pieces over there, but you never get the whole thing. So what? You have to go back (and ride it again)." During Friday's panel, moderator Michael Singer mentioned some recently announced changes to the Pirates ride - namely that the bride auction scene will be removed and replaced. The crowd in attendance erupted into boos. One man shouted the scene's classic line: "We wants the redhead." "Every attraction has had some kind of change since it opened," he said. "Walt did that constantly." "It's part of the tradition at Disneyland," Sklar continued, referencing ride updates and changes. "I only see it as positive."